The health division of Awamaki is taking some great strides with their home visit program. There are about ten patients in and around Ollanta who need our help, ranging from physical therapy, social visits, to some new adaptive technology to help them get around their homes and the town. Nick and I, two of the health volunteers with some carpentry, nursing and engineering background are working on making a plan for improvements for a local lady named Nati. Nati is a friendly, cheerful seventy-year-old woman who suffered a spinal cord injury about 40 years ago and lost the use of her legs. She is also hard of hearing because as a child, he brother poured hot liquid in her ears! 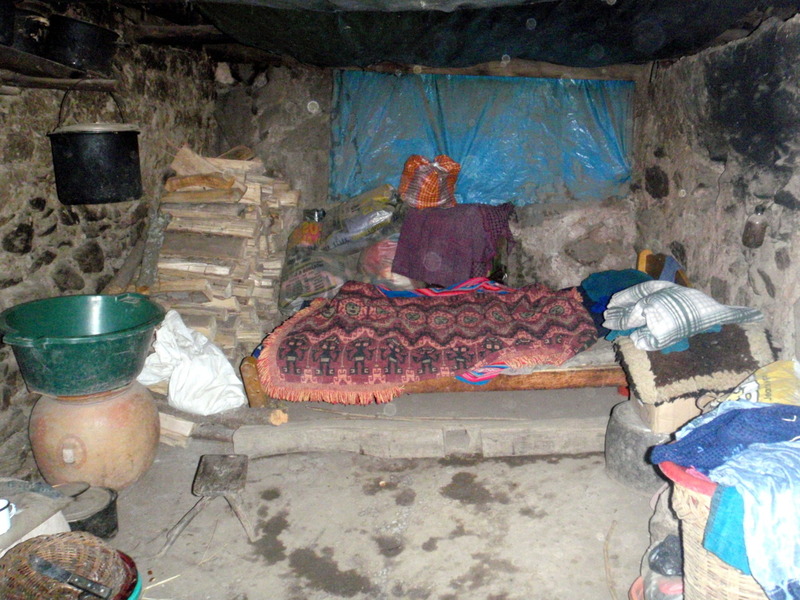 We visit her outside of her adobe hut on the side of a hill near the road coming into Ollanta. Right next door lives her nephew, Vicente, and his family. As Nati can’t walk, she scoots across the ground with her hands. Her bed is about 13” tall which makes it hard for her to get in and out of. She has a 5” step to get out of her hut, through a doorway that measured only 15” wide at the base (not big enough for her wheelchair!) She has a wheelchair from freewheelchairmission.org made from a plastic lawn chair, bike wheels and a metal frame, but as she spent so many years seated on the ground the height of it really scares her. She also cannot use it on her own. 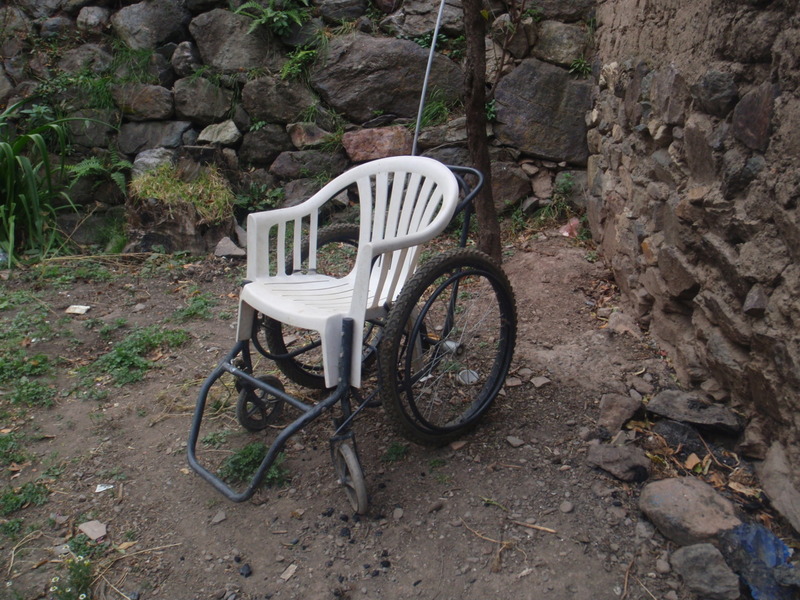 Our immediate goal with Nati is to help make moving around inside her home easier and modify her wheelchair so it isn’t as scary. This sounds simple, but Nick and I have come up with so many options! Our latest and best idea is to give her a new floor that is about 5” taller all around, which would help with accessibility and cleanability. 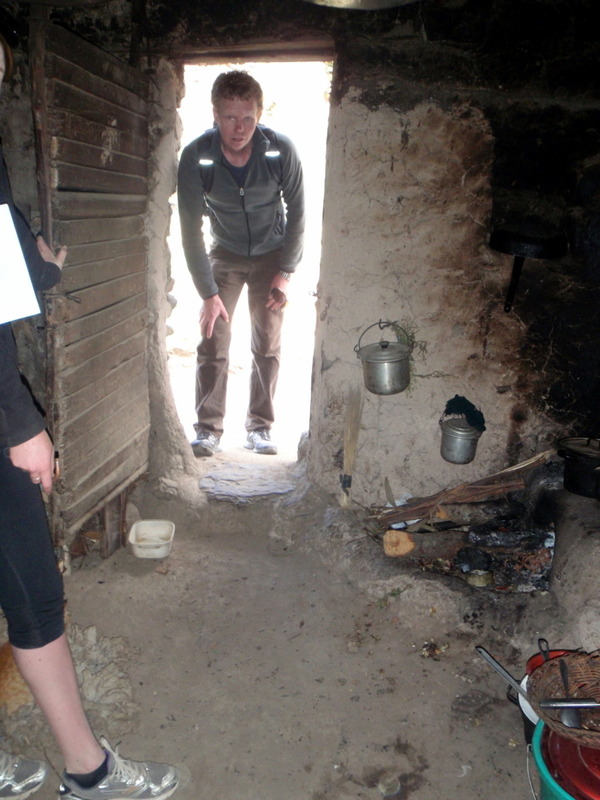 Our first idea was cement, but we were concerned about curability in the dark, cold adobe hut and overall cost. Or, maybe cement blocks. But, those would be harder to custom fit uneven dirt floor and adobe walls. Then, we thought we’d use adobe bricks. We talked to a few people about where to get them, and then thought we could make them ourselves! This was pretty appealing to us because we thought it’d be fun to make the bricks and sounded like an ideal solution for Nati. So, we went to get buy in from Nati and her nephew. We were advised to take things slowly, and I figured we’d have to really manage expectations. Both turned out to be right on the money. We got there and Vicente was pretty excited about a new floor of mud brick. We talked to him and Nati about it, then got inside to re-examine what we would be doing. When we first visited we weren’t even thinking about a whole new floor so we had different things to consider now. I got to talking with Vicente, translating for Nick, and asking about what kinds of problems he might foresee, what other things might be nice for her, what resources he already had, and whether he thought it was a good idea at all. About 10 minutes into the conversation, he said, why not use cement? It would be prettier. Oh, and he happened to do a lot of work with cement as a job. Nick and I were immediately interested because another Awamaki project had seven 42.5kg bags of cement leftover! Upon further conversation with Vicente we discovered that there was leftover sand to mix with the cement from a city project and he could talk to the alcalde to see if we could use it. Bonus! So, we talked a little more about the details and timing. We have to wait for the alcalde to come back from a trip on the 29th to ask to use the sand, and we have to try to do it before the 15th of July when Vicente leaves for more work. Plus, the way time works here is so laid back and… well, play-it-by-ear-right-up-to-the-wire that we could schedule it for July 6th and it might not happen until the 12th, or we might have to just come back every morning to try and see whether the family is available that day. Either way, plans are moving forward and hopefully in the next three weeks Nati will be able to move around her home much more easily. As for the wheelchair, once we have a little more free time, we’ll commandeer the wheelchair and lower the seat to about 1ft off the ground.